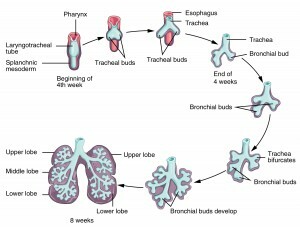 Learn all there is to know about lung development from Prof. John McLachlan and take this opportunity to improve upon your exam preparation. High-yield quiz questions and well-elaborated topic reviews will provide you with further information and help you to deepen your medical knowledge in order to achieve your exam goals. Breathing and eating - two skills humans master from birth. The digestive system and the lungs are vital organs, and their complexity still poses many questions to physicians. In order to understand them and also their pathogenesis, one must know how they developed. Embryology helps to elucidate the structure, function and interrelationships of all organs. This article discusses, step by step, the development of the gastrointestinal tract and the bronchial system from the primitive gut tube. In the ranking of most popular study subjects among students, embryology is often near the bottom. In exams, the (admittedly) rare questions on the field can allow the student to shine by knowing only a limited number of facts, and, on a normal day in the clinic, symptoms and malformations stemming from this developmental period are hardly uncommon so it is indeed worthwhile looking into the details of this field, and not just for aspiring pediatricians. This article explains the most important facts about the development of the body cavities and the relevant symptoms. Peter J. Ward, Ph.D. has been teaching embryology, anatomy, histology, and neuroscience since 2005. He attended Carnegie Mellon University and later earned a Ph.D. in medical anatomy education from Purdue University. 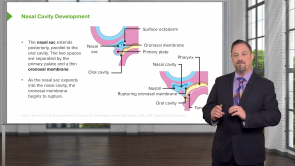 Dr. Ward enjoys finding ways to simplify the complex processes involved in human development and highlights the clinically-important aspects of embryology. Throughout these lectures, Dr. Ward shows how embryonic structures morph into the mature organs and other structures of the human body. Professor Ward is excellent! He ties this well with histo as well!